The sciatic nerve is a major nerve that begins deep in the lower back, runs through the hip and deep into each buttock before traveling down each leg. Sciatica occurs when there is significant pressure on one or more of the lumbar nerve roots, causing pain. Sciatica is not a diagnosis as much as it is a description of symptoms. Pressure on the sciatic nerve can be caused by a variety of conditions including; herniated disc spinal stenosis, degenerative disc disease, spondylolisthesis, or other abnormalities of vertebrae. Medical professionals may also refer to sciatica as radiculopathy - a medical term used to describe pain, numbness, tingling, and weakness in the arms or legs caused by a nerve root problem. Depending on where the sciatic nerve is being compressed, the pain can originate either deep inside the buttock, or even close to the spine. This can make it difficult to differentiate sciatica from other types of lower back pain. Additionally, sciatica can be a complication of other underlying lower back and pelvis conditions – and these may also cause pain in the upper and middle back. So often, the strongest indicators that you are specifically experiencing sciatica is tingling or pain traveling down one or both legs. Sciatica symptoms can vary widely and include tingling, numbness, or pain that radiates to the buttocks, legs, and feet. Sciatica sensations can vary from a mild tingling, dull ache, to a deep burning pain. In some cases, the pain is severe enough to cause mobility issues. In most cases, sciatic pain originates deep inside one of the buttocks and then radiates down the legs and feet. Some people experience a sharp pain in one part of the leg or hip and numbness in other parts. The affected leg may also feel weak or cold. Pain from sciatica often starts slowly, but can worsen depending where the pressure sits on the nerve and if there is increasing inflammation. 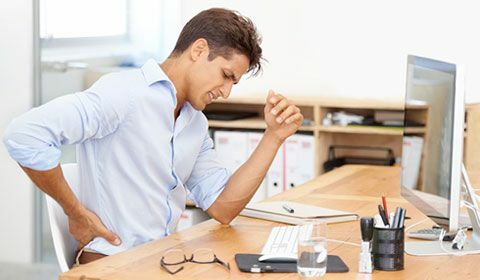 Sciatic pain may be exacerbated at night, after standing/sitting for long periods, when sneezing, coughing or laughing or from other exertions on the hips. Sciatic pain typically lasts less than six weeks, unless there are more serious underlying conditions. Pain that lasts longer than four weeks, or worsens from sitting, coughing, sneezing, or straining may require a longer recovery. There are several low back disorders that can cause or contribute to sciatica. The piriformis muscle, which attaches the lower part of the spine to the hipbone and sits right on top of the sciatic nerve, is one of the most common causes of sciatica. Piriformis syndrome develops when the piriformis muscle spasms, or is inflamed and compresses the sciatic nerve. Traumatic sciatica results from direct nerve compression caused by external forces to the lumbar or sacral spinal nerve roots. Falls, motor vehicle accidents and sports injuries can all be possible causes of sciatica. Traumatic impact can injure the nerves, or broken bone fragments can compress the nerves. A bulging or herniated disc is when the gel-like material within the spinal disc either expands like a balloon, or bursts. As a result, there is the possibility that the disc material will press against an adjacent nerve root and compress delicate nerve tissue, causing sciatic pain. 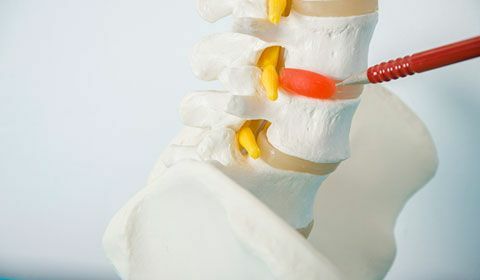 In the case of a herniated disc, there is compression of the nerve root and the disc material contains hyaluronic acid that causes further nerve inflammation. Spondylolisthesis is when one vertebra slips forward over an adjacent vertebra, causing a spinal nerve root compression that produces sciatic leg pain. Spondylolisthesis is usually developmental (from birth or developing during childhood) but can result from spinal degeneration, trauma or physical stress. 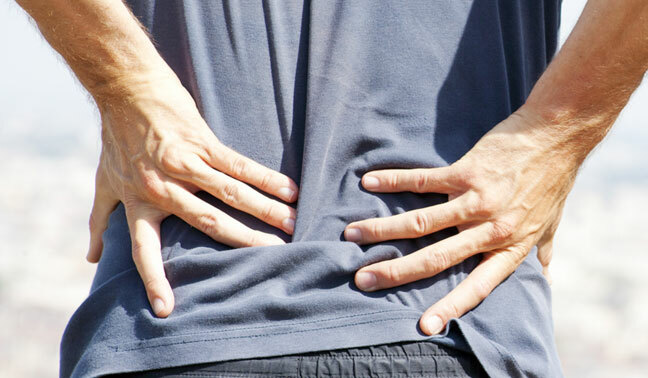 Sciatica most often develops over time but can be caused by a single traumatic event. The vast majority of sciatica symptoms improve after a few weeks or months without surgical intervention. For some however, the leg pain can be severe and debilitating. If you believe you are experiencing sciatica, it is recommended to see a healthcare professional, both to determine an appropriate pain management/reduction plan – but also to ensure it’s not a more serious medical issue. Because there are many potential causes of sciatic nerve compression, treatment options vary and can be very different for individual patients. Although it is always recommended to seek the support of a medical professional, you may find that exercise, nutrition and general activity are great ways to keep sciatica at bay or help reduce its impact on your life.